1. 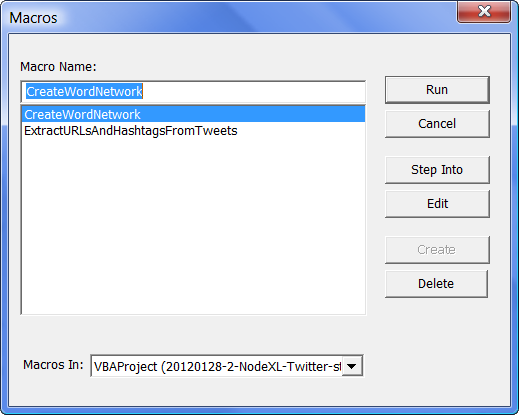 Create a new workbook, eg a list of tweets or an import from a Twitter search, whatever. Save it as .xlsm. The m is important. 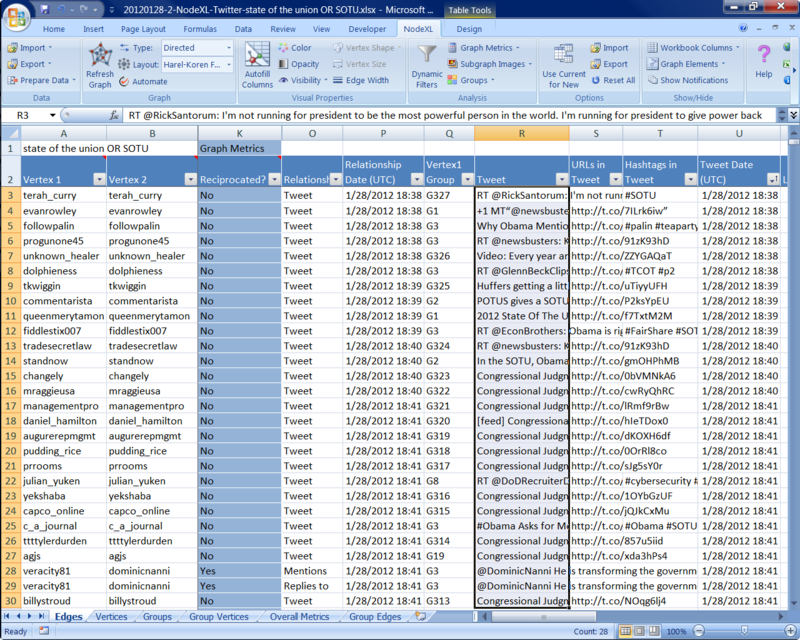 This can be an existing NodeXL workbook. 2. Go to Developer -> Macros. Make up a name; it doesn’t matter because it’ll get overwritten. Then press Create. the VBA window will open. 3. In the big text are that says “Sub whatever() End Sub”, select all that text and delete it. Paste in the contents of the text file below. 4. Go to Tools->Reference. Check the checkboxes for “Microsoft Scripting Runtime” and “Microsott VBScript Regular Expressions”. Press OK. Save the file (File->Save) then exit (“Close and return to Microsoft Excel”). 5. Now go to Developer -> Macros. Choose CreateWordNet and press the Run button. 6. It’ll ask you for a worksheet name, a column and a start-row. Then it’ll create a new worksheet with the edgelist in it. 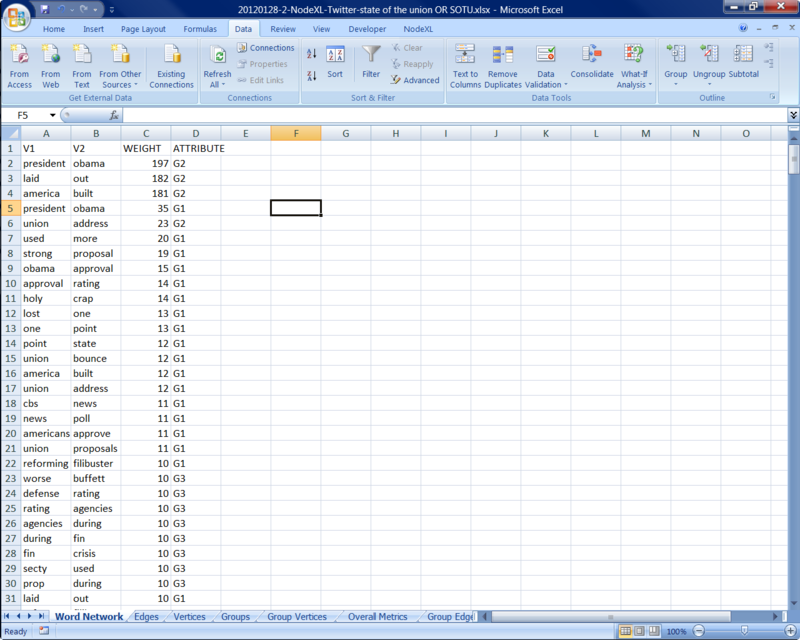 The edge list is not directed (there isn’t really a concept of direction in “co-occurs”) but is weighted. Each pair is weighted by the number of times it appears. 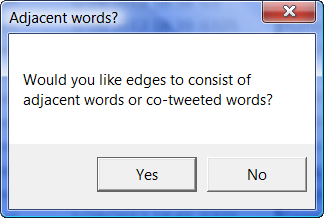 This version also includes options for edge creation. First, it is now possible to suppress edges of weight=1, which is helpful in getting rid of a lot of garbage. Second, it is now possible to defined edges by adjacency or co-tweeting. Given a tweet of words “w1 w2 w3” adjacency will give edges w1-w2 and w2-w3, while co-tweeting will give edges w1-w2, w1-w3, w2-w3. 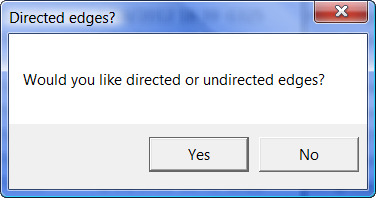 For edges defined by adjacency, you may choose directed or undirected edges. So a tweet of “Marc Smith Marc” (for example) would generate the weighted directed edges Marc,Smith,1 and Smith,Marc,1 while the sole undirected edge would be Marc,Smith,2. That is, for undirected edges (where ordering doesn’t matter) the words are alphabetized. 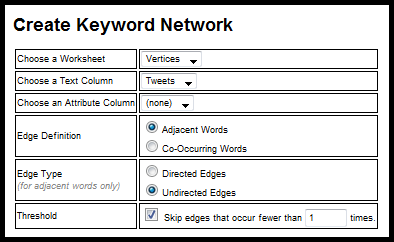 Start with a NodeXL workbook with a column of text for either Vertices or Edges (or any column of text). 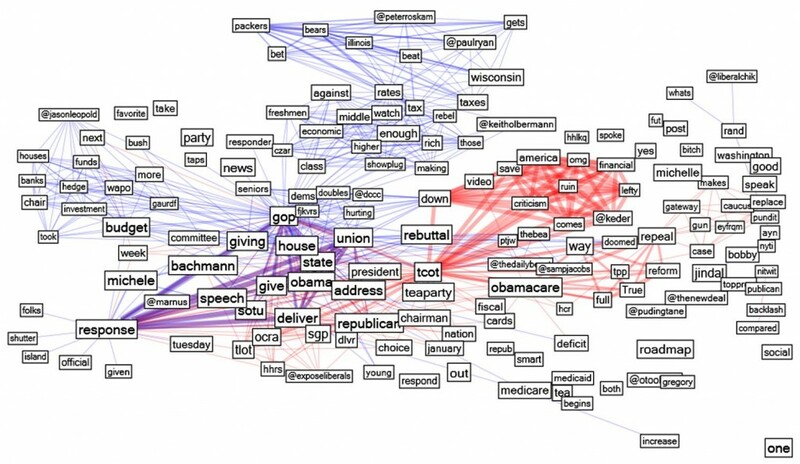 Here we have the tweet text of a recent Twitter Search Term network query. Select “Developer” from the Excel menu and create a new Macro. I take the text of Scott’s macro and paste it here, replacing everything else in the code buffer. Note the selection of Tools>References> needed to run this macro! 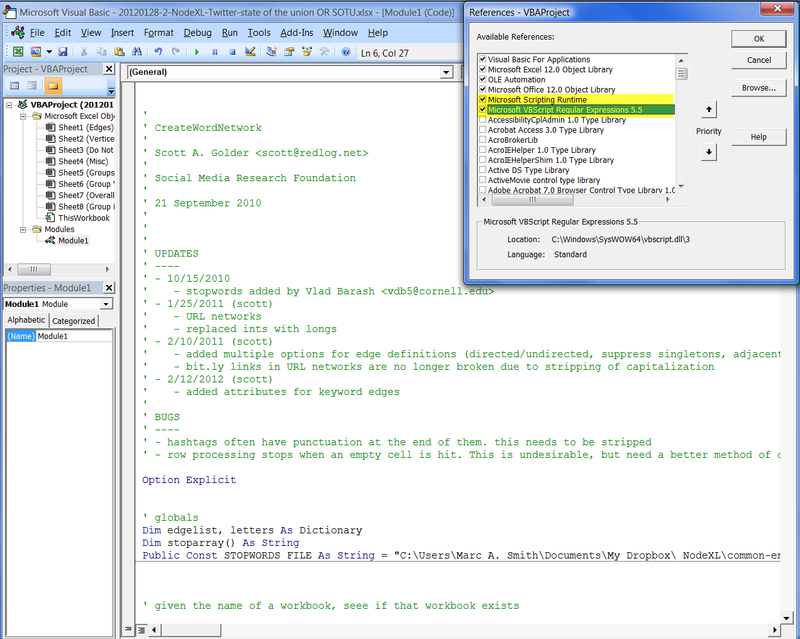 Select Microsoft Scripting Runtime and Microsoft VBScript Regular Expressions 5.5. The macro will copy an edge attribute forward if specified (note, I think the *last* attribute for any AB pair is what is reported). The user is asked if the results should omit the singleton edges, which can be useful. Edges can be defined as co-sequential or co-cell: ie. ABCD can generate AB, BC, CD or AB, AC, AD, etc. Users select if they want the edges to include their reciprocal (i.e. 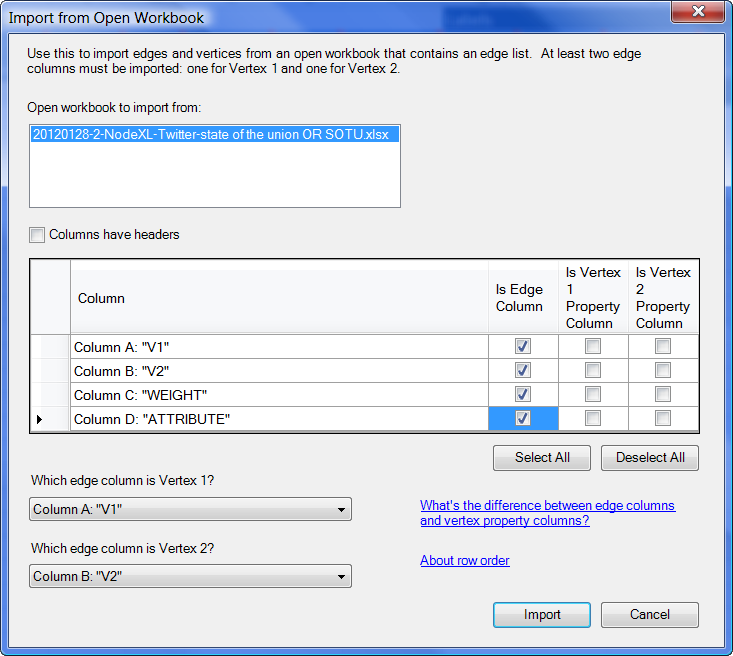 generate a “BA” edge for each “AB” edge). The result is a worksheet with word pair edges and the weights of their frequency of occurrence. This entry was posted in All posts, Foundation, Measuring social media, Network data providers (spigots), Network metrics and measures, NodeXL, SMRF, Social Media, Social network, Twitter, Visualization and tagged 2011, Analytics, Co-occurrence, Content, Feature, Keyword, network, Networks, NLP, NodeXL, Scott Golder, Semantic, SMRF, Social Media Research Foundation, Text, Vladimir Barash. Bookmark the permalink. 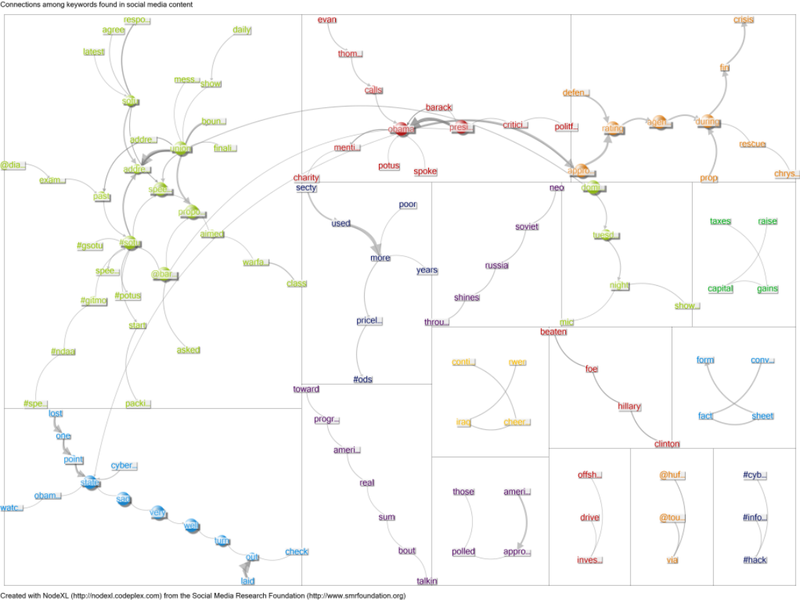 I have been looking for a way to do something like this but with a large number of PDF documents to create a word cloud. Do you know if that is possible? This extension to NodeXL is not what you want (it does not work on pdfs). I’m trying to run the macro. It tries to read a stopwords file (common-english-words.txt). I’m not sure of the format of the file it’s trying to read. Can you describe it? Thank you for the interest in the Keyword Network macro. Sorry to have omitted that important fact! The format is a list of words, comma delimited, with no spaces. I am not having much luck with the downloaded VBA code in text file. Wondering if you could send me an excel with the working code included?